I ran across an article this week that inspired me to make this post. The article was praising plants and horticulturalists and was written by Carmen Cosentino. I guess that mostly I am grateful for the plants that I work with every day. I want to tell you a story about one plant. It was an orchid plant. Ever since my high school days, I have been enamored by them and collected them. I bought a plant called Brassavola digbyana and grew it for six or seven years, and it never bloomed. Then, there it was in August of 1962, just in time for me to make a corsage for Anne Marie to wear on our wedding day. It never bloomed again — for 50 years, until July of 2012. I placed that single bloom on Anne’s shoulder upon her passing. It has not bloomed since. I guess what I am saying is that I am grateful for the beauty that surrounds us, as well as the mysteries of plant life that I will probably never understand. 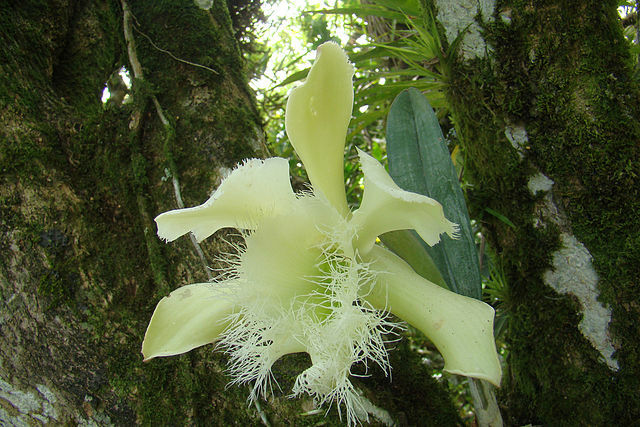 The story, above, about Carmen's Brassavola digbyana reminded me of a Christmas Day many years ago. I had finally graduated from college and was working my first job in a hospital on the 7AM-3:30 shift. The harsh reality of the real world hit me when I was assigned to work Christmas Day just a few months out of college. It was a cold morning in Nebraska and I'd been feeling rather sorry for myself for being alone on Christmas, unable to be with family, and so on and so forth. Back then I could barely wake myself up to get to work by 7AM, especially on those shortest daylight hour days of the year surrounding winter solstice. Always a lover of plants, I had a Christmas cactus in my apartment at the time. It was a small one that I think my Grandmother had given to me. I didn't pay much attention to it as it was so unremarkable. But that Christmas morning as I stumbled around preparing to go to work, I discovered that it was blooming for the first time! It made me marvel, it carried my day, and it made me happy all day. What a multitude of lessons that plant taught me and I shall never forget it.